Whilst the conversion process itself can take a while on a large system, and can appear complicated, the process is actually quite simple to do. In my example below, I will be starting the conversion of another Invision community database into a new installation of the Invision community software. The process itself is very similar for any conversion. So for example, if you are converting from a vbulletin installation, or a xenforo installation, the process is the same. The only difference is that the questions asked by the converter will be relevant to that specific converter. If you have not read the previous step in this guide, we would advise you to do this now. Reading that step will save you a lot of time. You will then be asked to select the software that you are converting from. Please select this from the list provided. On the next screen, you will be asked to select the items you wish to convert. By default all items are selected, however, you can uncheck anything you wish not to convert. Note that some items, which are required by the converter, cannot be deselected. Next you will be asked to provide your database details. These are the details of the database in which you are converting. So it would be the database you are using for your current installation, and not your Invision Community installation. On the final page, before you begin the conversion, you will need to provide the details for each item you are converting. This will include things such as paths to your uploads or attachment folders, paths to creations, group mappings and more. It is highly important that you go through this page carefully, and ensure that the details you provide are correct. Once you click to submit this page, you will see the converter start the conversion process. Please do not close this page until it is completed. After the conversion has completed there are two things that you should note. While the conversion process is complete, the software will now be rebuilding all your content. Until these are complete, you may find some posts may not look quite right, counters may be incorrect, and search will not be up to date. 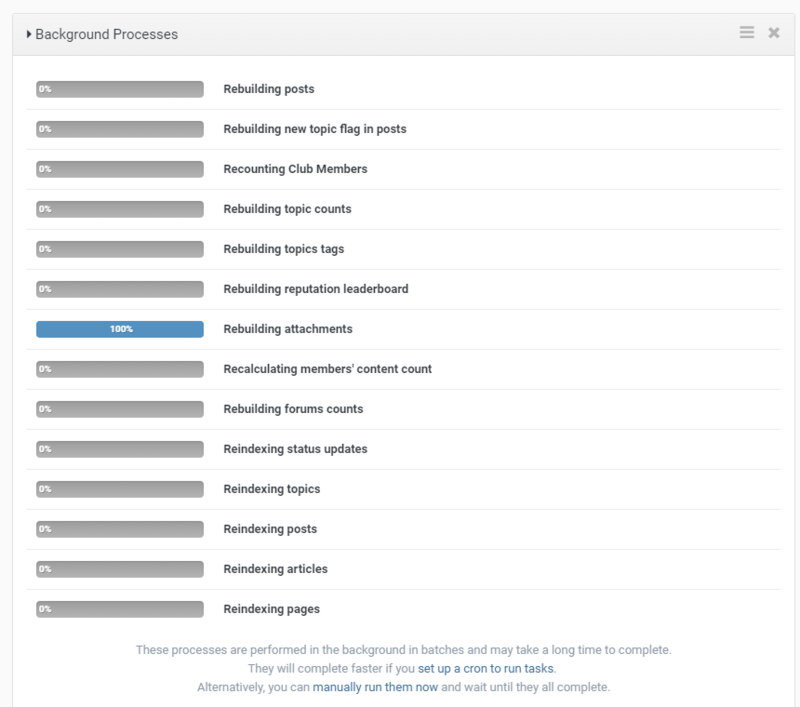 You can see this on your Dashboard by expanding the "Background processes" section, as you can see in the image below. By default, these will run with traffic. Therefore if you have no traffic on your site, they will not be running. In this scenario, you can either set up a cron task on your server, by clicking the link provided to get the details for this, or you can select "Manually run them now" and leave this open on the page.